HOLLISTON, Mass., Nov. 7, 2018 /PRNewswire/ -- Biostage, Inc. (OTCQB: BSTG), a biotechnology company developing bioengineered organ implants to treat life-threatening conditions of the esophagus, bronchus, and trachea, today announced appointing Ms. Ting Li to its Board of Directors after her valuable role this year in securing funding for the Company, effective November 6, 2018. Ms. Li brings over 20 years of investment banking experience, building relationships between customers and enterprises. Ms. Li is currently a managing partner at Donghai Securities Co., Ltd, a top asset management company in China, and also serves as the Vice President of the Jilin Enterprise Chamber of Commerce and advisor of the School of Continuing Education of Tsinghua University. Ms. Li holds a bachelor degree in accounting from China's Changchun Taxation College in Changchun, Jilin Province, and a master's degree in software engineering from Jilin University, also in Changchun. 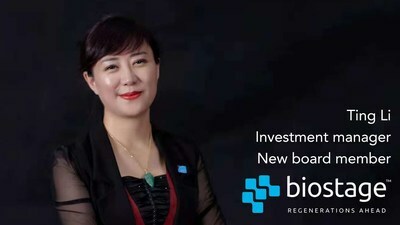 Ms. Li commented, "I am honored and motivated to join the Biostage Board of Directors. The Company is working to bring a valuable medical technology to patients, especially children, in need of better solutions and outcomes. I believe my experience forging relationships between investors and enterprises will support Biostage's access to the capital needed to support its strategy to bring its technology to China." Biostage CEO Jim McGorry commented, "I and the other members of the company's Board are pleased to welcome Ms. Li to the Biostage Board. Ms. Li's experience building relationships between customers and investment institutions in the China securities industry will be invaluable as Biostage develops plans to expand our programs in the China market."